Trophy Hunters Alberta offers big game rut hunts on large tracts of crown land starting in mid September to the middle of October. We hunt moose using various methods to attract the moose to our hunters. If one method is not working, we can change the plan and/or location as required. THA provides both archery and rifle hunts for Alberta's massive Western Canada moose. Our guides are tested, proven and capable, with all of our archery hunts being guided by experienced bow hunters. All of our guides are experienced in calling and moving moose. 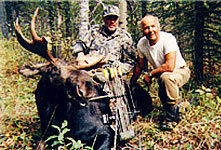 We offer an early season 6-day archery moose hunts in WMU 330 & 412. The season opens typically August 25 and we operate this hunt until the third week in September. These hunts utilize remote camps, local hotel or chalets. We will access the area by 4x4 vehicle, ATVs and/or walking. By focussing on watering holes and red willows we are able to glass open meadows for moose activity. We offer 6-day archery moose hunts in WMUs 314, 316, 318, 320, 322, 324, 326, 328 & 330, all excellent moose areas. WMU 314 & 316 utilizes either a remote trailer camp utilizing a motorhomes and travel trailers to provide all the comforts of home or the more rugged outfitter tent camp. ATVs are used to aid hunters gain better access to the hunting areas. WMU 318, 320, 322, 324, 326, 328, & 330 utilize local ranches or chalets to offer the comforts of a less remote hunt. Typical travel is done by vehicle or by foot. We offer our archery rut moose hunts at the end of September through the month of October. We find that the first and second week is the most productive time for the rut archery hunt.